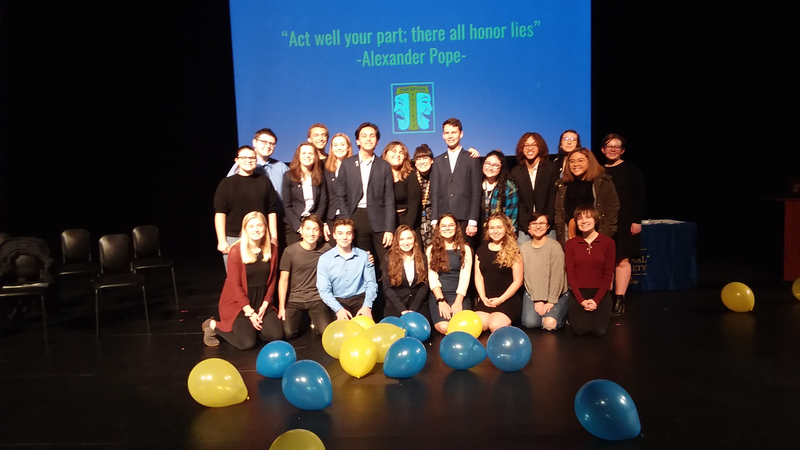 The Ridgefield High School Thespian Society welcomed six new inductees to the troupe at their mid-year induction on January 10. New to the troupe are: Cami McGravey, Emma Hauser, Kyshaun Summers, Peter Schafer, Clara Lewandowski, Kaitlyn St. John, and Jared Lee. According to Kaitlyn Etter, Theatre Arts Director for the high school, students are inducted based on a point system measuring their involvement in the theatre department over the course of their work on multiple productions. “Students are required to have 10 points (100 hours) to be inducted including two points from working “behind the scenes” on a production,” said Etter. The International Thespian Society (ITS) is an honor society that recognizes student achievement in theatre. Etter started RHS’ ITS troupe #8635 last year. “The Thespian Society gives students access to resources beyond Ridgefield, including college scholarships, enhancing college and employment applications, and tons of student leadership opportunities,” said Etter. The troupe did extremely well at its first ever Southwest Regional Acting and Technical theatre event in November. Garnering overall Excellent scores were students Cristyn LaChaine, Kennedy Howlett and Sofia Lee in the Solo Musical Theatre category; Bridget Donaldson and Sebastian Rojas-Rincon in the Duo Musical Theatre category; Callie Stenersen and Phoebe Langwell in the Duo Scene category; and Payton Kautz in the Stage Management category. These students will be recognized at the state competition in March. Awarded perfect “Superior” scores were Lily Ray for Solo Musical Theatre and Phoebe Langwell for Monologue. Both students will advance to Nationals in the summer. “Having a troupe at RHS not only gives students opportunities for learning at the various festivals throughout the year but also connections with other troupes from other schools across the U.S.,” said Etter.